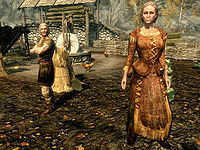 Help the Temple of Mara spread the cause of love throughout Skyrim. Dinya Balu wants you to help the cause of love throughout Skyrim. Speak to Dinya Balu in the Temple of Mara in Riften. Help Fastred, in Ivarstead, with her love interest. Help Calcelmo with his love. Help Ruki with her love. Dinya Balu is a priestess of the Temple of Mara in Riften, devoted to spreading the word and acts of the Divine. When you speak with her, asking for Mara's blessing, she will explain that earthly services on Mara's behalf are first required. When you are ready to go forth, bearing Mara's light, Dinya explains the visions that Mara has given her, and asks you to act in Mara's name to aid those who are having trouble with their love. Boti and Jofthor have differing opinions about their daughter's future. Dinya will first tell you of a young woman, confused and overwhelmed by her new found feelings. She will send you to Ivarstead to speak to Fastred, the conflicted girl. Fastred will tell you that she is in love with Bassianus Axius, but her parents will not let them be together; she will ask you to speak to them in that regard. Her mother, Boti, will reveal that she is not against the relationship, and even if Fastred were to run away with Bassianus, she would do her best to handle her husband's ire. Fastred's father, Jofthor, on the other hand, will make it clear that he does not want his daughter to leave town. He believes she is barely infatuated with Bassianus and will soon change her mind, just as she did with her previous interest, Klimmek. If you encourage Bassianus, he and Fastred will move to Riften. At this point, you can choose to talk to Bassianus, informing him of Boti's silent approval, or Klimmek, suggesting to him that he be more bold in regard to Fastred. The man you speak with will then proceed to meet with Fastred; they'll have a brief conversation which you must observe to advance the quest and ensure Mara's work is done. When the quest is completed, Bassianus will leave for Riften regardless of having favored him or not, though he will take Fastred with him if you favored him. In either case, return to Dinya Balu at the Temple of Mara to inform her of your success. Yngvar the Singer's poetry can melt hearts. While Dinya is pleased with your work in Ivarstead, there is more to do. Dinya next will send you to Markarth to speak to Calcelmo. 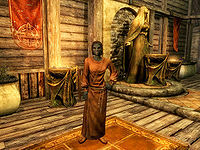 Calcelmo is a great Scholar of Markarth, Dwemer researcher, and powerful conjurer. But for all of his worldliness and knowledge is simply undone by Faleen, a Redguard warrior and housecarl. Speaking directly to Faleen about Calcelmo reveals that she doesn't really have much of an opinion about the scholar. To confound the issue, Calcelmo is afraid of speaking to Faleen. He doesn't know what to talk about and worries that he'll make a bad impression by raising the wrong topic. Clearly, some type of intervention is needed. Calcelmo asks you to find out more about Faleen from her friend, Yngvar the Singer, who is quite the lady's man himself. He can usually be found inside the Silver-Blood Inn during the day or in the Treasury House at night. You can tell Yngvar that Calcelmo is interested in Faleen, or choose to keep Calcelmo's identity a secret. In either case, Yngvar will be happy for his friend and eager to help, for a price. He will offer a romantic poem, ostensibly written by Calcelmo for Faleen, for two hundred gold. When you have completed the transaction, deliver the poem to Faleen. She will be touched and write Calcelmo an encouraging letter in response. Calcelmo and Faleen confessing their love to each other. Give the letter to Calcelmo and he will run off to meet her. Follow him to see them express their mutual affection in person, and the quest will complete. Note: If you complete this quest after the Stormcloaks have claimed Markarth, Faleen will have been relocated to Solitude. This will cause Calcelmo to run all the way from Markarth to Solitude to speak to her. If that happens, fast-travel to the Blue Palace to witness their conversation and complete the quest. Ruki waiting at Gjukar's Monument. When you return, Dinya Balu will congratulate you on helping both young and seasoned love find its way. However, she has a final challenge for you; to reach beyond death to reunite a couple torn apart by war. For this Dinya will give you an Amulet of Mara, which you will need to have equipped in order to see the couple. 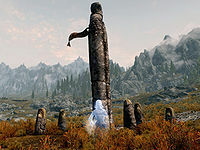 You will need to travel to Gjukar's Monument, a stone monument commemorating an ancient battle southeast of Rorikstead. Here, the ghost of a woman named Ruki is futilely searching the remnants of a battle that only she can see. She thinks that she is still alive and is looking for her love, Fenrig. She had word that the battle did not go well, but she has been unable to find his body. Ruki and Fenrig ascending into the sky. 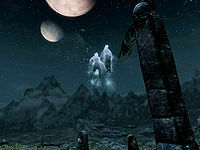 Following your quest marker to Fenrig brings you to his ghost, who believes he is still at camp on the eve of the battle, having apparently been killed in an enemy raid prior to the battle itself. You give him word that his Ruki has come looking for him, and he agrees to follow you. Bring him back to Ruki and they will be confused, but happy that they are together. Watch their spirits ascend into the sky to an eternity together among the stars. Return to Dinya Balu where she will bestow Mara's blessing upon you as well as the resist magic active effect, Agent of Mara. You may also keep the Amulet of Mara given to you, to aid you in finding a spouse. Dinya Balu will not give out the quest Spread the Love while this quest is active. If you watch carefully as Ruki and Fenrig are lifted into the sky, you can notice that they will experience a sudden drop before becoming invisible. 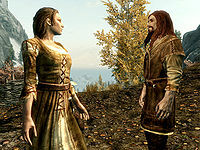 If you have completed the civil war quest line for the Imperial Legion after giving Markarth to the Stormcloaks in Season Unending, Yngvar the Singer will be in Windhelm with the other captured Stormcloak supporters. Simply go in the Palace of the Kings and he will be at the table before the throne. After choosing which suitor succeeds for Fastred you must follow him to her and observe the conversation between the lovers, otherwise the quest will not update and you can't receive the next quest in the chain. Unlike the "Agent of Dibella" reward, this quest reward is listed as "Resist Magic" in Active Effects rather than "Agent of Mara". It is possible to avoid mentioning Calcelmo entirely while talking to Yngvar about the love poem, yet his name will still appear on the poem - "from Calcelmo to Faleen". If you leave the area after choosing Bassianus Axius for Fastred's companion and then return before seeing Dinya Balu, it is possible to get conversation from Fastred's parents like she left the town (though both lovers are still in Ivarstead continuing their regular activities) and overhearing Fastred's father very next moment upbraiding her not to talk with pilgrims. At the same time Bassianus has the same dialogue in the local inn as he did before meeting Fastred on your encouragement, even with Jofthor nearby. It's quite amusing to see both of them, Bassianus and Jofthor in the inn at the same time under these circumstances. 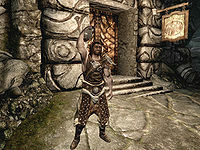 Yngvar the Singer or Faleen may not give you their respective letters, preventing you from advancing through the quest. Fenrig may vanish after asking you to lead the way to Ruki and never reappear. If you then either fast travel or run to Ruki, she has the quest marker indicating to talk to her next, but she does not respond. Advance the quest using the console command setstage t02 100. Another console solution is using prid 38288 and then using enable. This will bring Fenrig back and he will follow you. Provided no followers are with you, after speaking to Fenrig, when he responds stating: "If she's come this far from home..." exit the conversation and quickly fast travel to Ruki's location at the monument. Fenrig will have already joined your party and travel with you. Upon arrival, the scripted conversation between the two occurs and the quest updates as normal. If the other suggested fixes do not work for you after trying them try reloading before the quest. Speak to Ruki then when you talk to Fenrig simply allow him to finish his lines. If he seems to disappear do not panic. Just walk back to Ruki (not fast travel) and the scene when they talk and float into the air should happen normally. Remove the amulet of Mara after speaking to Fenrig, and travel back to Ruki. If Fenrig disappears and you are unable to interact with Ruki, enter the items menu, remove the amulet and then exit the menu. The quest should update and inform you to equip the amulet and Ruki should disappear. If you then re-equip the amulet and wait a few moments, Ruki will appear again and move to interact with Fenrig, who also should have appeared nearby. If Ruki or Fenrig get in a fight with a dragon while they have the quest marker, they may become unresponsive. Advance the quest using the console command setstage t02 90. Fast traveling away and then coming back may reset the dialogue menu, allowing you continue with the quest. Both Ruki and Fenrig can ascend into the sky and then fall. After that, they ascend a few feet off of the ground and stay there. Simply reload the last known save before both meet to fix the issue. Waiting for one hour may also fix the problem. Picking up extra Amulets of Mara may cause you to be unable to equip the one that is given to you, which is required to progress the quest. This will prevent you from completing the quest. PC players can use the following console commands to work around this bug: stopquest t02, then resetquest t02, and finally setstage t02 100. Return to Dinya Balu to finish the quest. As an alternative that allows quest continuation, PC players can use the console to drop all Amulets of Mara in possession and then pick up only the quest item. If 3 or more Amulets are in possession, the non-quest Amulets will stack, allowing for easy identification of the quest Amulet. Use the command: help "amulet of mara" to get the item ID code (marked "ARMO"), then player.drop (ID) (#) where (ID) is the item ID code from the previous command, and (#) is the numeric number of Amulets of Mara possessed by the player. For example: player.drop 000C891B 3. Finally, pick up one of the Amulets of Mara and put it on, and if the proper quest Amulet has been identified the quest will resume. Console players can have interactions with authorities. Steal a different amulet of Mara to add to you list. Then get a guard to remove your stolen goods. The reorder should put the required amulet to the top. 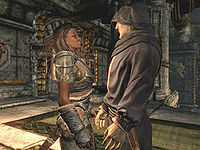 10 I've agreed to help the Temple of Mara help the cause of love throughout Skyrim. On the PC, it is possible to use the console to advance through the quest by entering setstage t02 stage, where stage is the number of the stage you wish to complete. It is not possible to un-complete (i.e. go back) quest stages, but it is possible to clear all stages of the quest using resetquest t02. This page was last modified on 12 November 2018, at 13:25.